Ah, now this is a bit more like it! At the time of writing this, I had just finished my reviews of Andro Dunos and Ghost Pilots. Those are two very bland shoot 'em ups. I came to review this game and I was expecting another boring shoot 'em up, however I was pleasantly surprised to find that this game was actually fairly good. It isn't the best shooter available for this system, but it is definitely far more interesting to play than the latter two games. 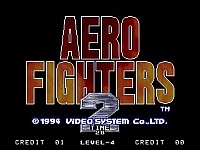 Aero Wings is a vertically scrolling shooter. You get to pick from a variety of craft, each with its own special weapons. Then you go out and kick the crap out of anything that moves. 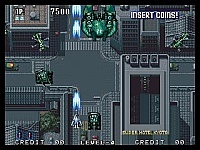 After a couple of stages, you get a bonus level where you have to quickly destroy a bunch of enemy craft to gain power ups. 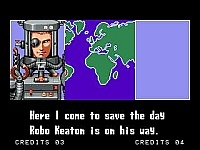 To be truthful, this plays in the same way as just about every other shoot 'em up on Neo Geo, but it is more fun to play than many of the others. 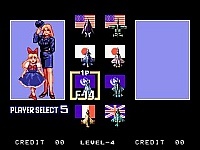 The character selection also adds a little variety to the game, as does the fact that there are lots of different enemies to kill and some decent bosses. There is also some nice graphical variety to the stages. On one level you are above Japan, in another you are flying above a fairground where you can see a moving roller coaster and a big wheel, which you can blow up. Then there is also New York complete with the Statue of Liberty visible below you. I found that the sound is quite average with some nice explosions, and music that can be summed up as "passable" but got on my nerves after a while. Like I said, this game isn't exactly amazing but it is much more fun to play than a lot of the other shooters available. There are also many better examples of its type like Blazing Star and Pulstar, but you could do much worse than to give this a try.